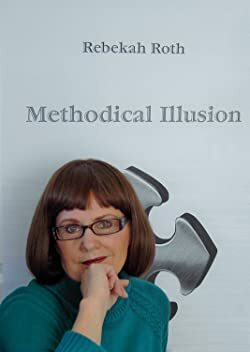 "Methodical illusion" appears to be the first novel by a certain Rebekah Roth. The planes where hijacked remotely and flown to certain hangars, where passengers where forced to make cell phone calls, and later executed or disappeared. The towers, in the meantime, where demolished using missiles or military planes. Behind the whole thing the Mossad, and in particular the Israeli political elite in the person of Sharon. No mention of complicity from the media, no mention of fake victims, no mention of fakery at any level. The technique is always the same, basically giving a number of potential truths to the public, as long as the possibility of fakery is never mentioned or admitted. The few truths are essentially the fact that 1) cellphone calls were impossible from the planes 2) planes do not disappear into steel buildings 3) the mossad had positive interest in seeing 9/11 happening. There are probably other things, but we can bet nothing that could seriously suggest the idea of simulation behind the whole enterprise. The simple idea that those phone calls had to be made serves like no other argument to "demonstrate" that family members where actually out there, receiving phone calls. Rehashing the idea of missiles serves to "demonstrate" that videos of 9/11 can really be used to understand "what really happened". Etc. Especially incongruous is that this author (probably a Sim), appears to be a 100% jewish flight attendant-whistleblower, and yet would 1) escape the clutches of a gag order evidently extending to all people involved in airlines companies and 2) pin all the guilt on Israel. Well, most likely an author with a jewish name was required so that the accusation against the mossad would not be immediately dismissed as "antisemitism". On the other hand, being the book in the form of a novel, there is nothing in it really incriminating against the Mossad, Israel or Sharon. Everything stays in the territory of pure fantasy and mind-game. I enjoyed a very exciting life both in the air and on the ground and because of that, was encouraged by co-workers to write a book. As I began to do that, I discovered that ten of the accused 9/11 hijackers were still alive. Several of them were also airline employees employed with Saudi Arabia Airlines and that they had had their identifications stolen years prior to 9/11. At least four of the accused hijackers threatened to sue the U.S. Government and the FBI if they did not stop using their names and identities. That discovery, along with the refusal by the U.S. government to discontinue their false accusations; ignited my curiosity. After thousands hours of research, using official government documents, print and video media from 9/11, and several books; I discovered that there were also at least two women involved in the 9/11 event. Using my personal knowledge of in-flight procedures, FAA hijacking protocols, the state of Massachusetts and cell phone technology, I discovered yet to be exposed details concerning the planes, the passengers and the perpetrators which are woven into Methodical Illusion. This book is the result of my extensive research. It is based on real life events. It is written as a novel to protect me and my family from the repercussions that inevitably occur when you get too close to the truth. I am now considered by many to be a foremost expert on the events of September 11, 2001. Oh, good. Yet another sim-researcher proposing itself as a foremost expert. We really needed that. The order of the day, as usual, is confusion. Oh geez, not another one! “I am now considered by many to be a foremost expert on the events of September 11, 2001.” What “many” is that? The established Gatekeepers and Kooky Klub Truthers? In that radio interview with “Dr” Kevin Barrett she claims she found someone who was “there” at the “location” that the “planes” were taken. “KTYS Media is a Boutique Publishing House for Books that Invoke a Change of Heart or a Change of Mind.” Whatever the hell that’s supposed to mean — with only 2 books listed: this shill’s recycled crap & some romance novel by a “Michael A. Harris”. The term eggcorn was coined by a professor of linguistics, Geoffrey Pullum, in September 2003, in response to an article by Mark Liberman on the website Language Log, a blog for linguists. Liberman discussed the case of a woman who substitutes the phrase egg corn for the word acorn, and argued that the precise phenomenon lacked a name. Pullum suggested using "eggcorn" itself as a label for the class of error. The phenomenon is very similar to the form of wordplay known as the pun, except that, by definition, the speaker (or writer) intends the pun to have some humorous effect on the recipient, whereas one who speaks or writes an eggcorn is unaware of the mistake. "The psychological tension that occurs when one holds mutually exclusive beliefs or attitudes and that often motivates people to modify their thoughts or behaviors in order to reduce the tension."